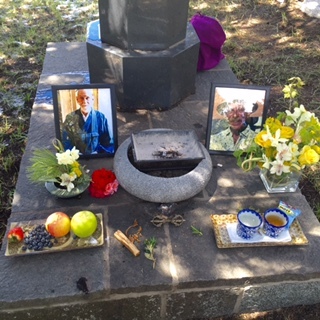 Vanja wrote: we had a nice ceremony at Hokoji yesterday (April 30, 2016). The weather played along nicely, and there was an assorted crowd of maybe 80 +, … the old Zennies, Bob’s adopted Indian family, Stan’s friends from Taos… Yoshiko (Kobun's daughter) also attended. Both Bob and Stan passed on last December. I was not aware of their crucial situation, but somehow happened to be here at the time. 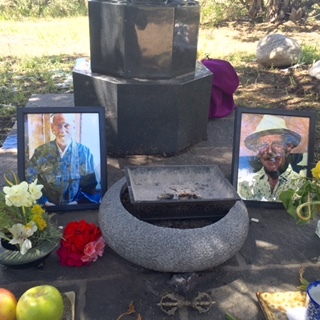 Sandy (Watkins) had just flown in from Hawaii, and we chanted the Heart Sutra and did Shasui at Bob’s bed, after which he peacefully stopped breathing. Stan fell sometimes during summer and was brought to a hospital and then sent to a closed psychiatric institution. Some efforts were made by the sangha to know about his whereabouts, obviously with no success, since only family members are given any information. In December, I was able to locate him in a retirement home in Santa Fe, and he got quite some visitors and there were actually three folks with him when he took his last breath on December 16th (three days after I had flown back to Europe). 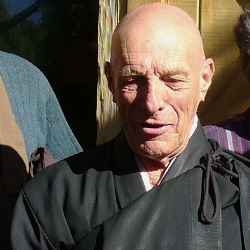 From the Hokoji website: Esteemed Teacher: Stan Butan White a long time diciple of Kobun Chino Otogawa Roshi's. He moved to Hokoji in 1988. Butan sama was head priest for many years at Hokoji. 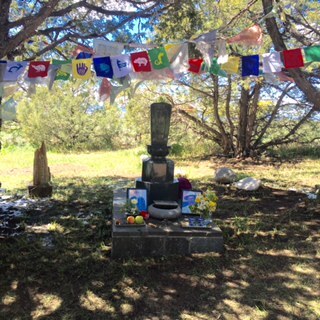 Butan Stan White was a temple priest of Hokoji, a Buddhist community near Taos, New Mexico established by Kobun Chino and Bob Watkins in 1983. He is a Dharma heir of Vanja Palmers. 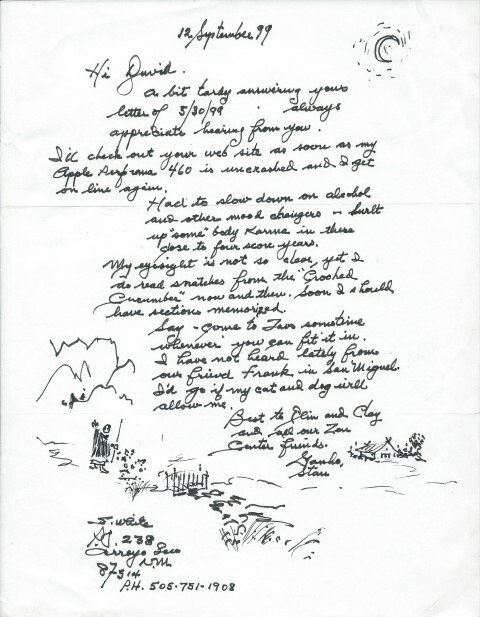 Letter from Stan to DC after he'd read the interview with back of envelop below and below that his sign off doodle which is once again most appropriate since it was sent twelve years ago. And his address is there, might still be good. 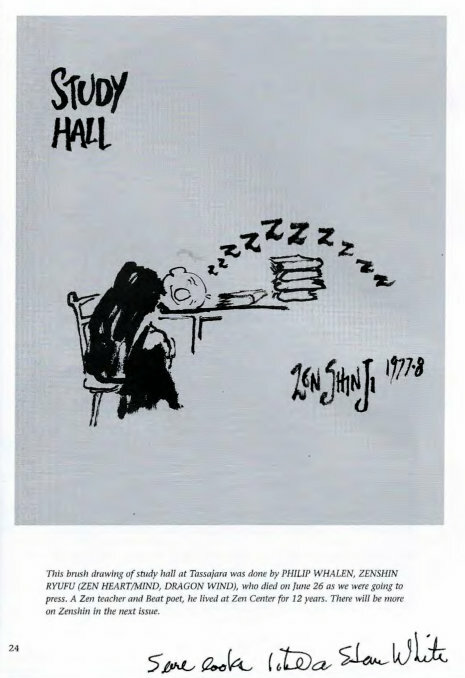 This is the first collection of Stan White's ink drawings to ever be published. The drawings chosen by the editor, Donnalynn Chase, capture the essence of Soto Zen practice. Not only are his sumi-e "cartoons" skillfully composed, they are insightful tidbits of the early days of Zen in America. The forty-two black and white drawings by Stan White contained in this book span from 1978 to 2008 and depict numerous aspects of practice. Kobun Chino Otogawa Roshi, White's teacher, helped to establish the majority of the temples reflected in the drawings . 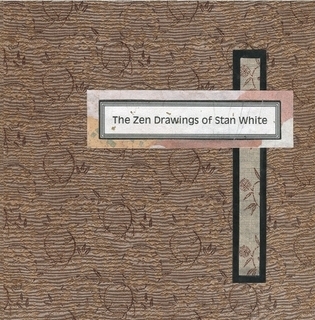 Whether or not you are a Zen student, chances are that you will enjoy the candor and spirit of Stan White's Zen drawings. Got the above off summer 2002 Wind Bell. See my note written on the page. I emailed Vanja Palmers and he confirmed it's Stan's not Philip Whalen's. Later found the next Wind Bell corrected that error.